Durability of reaction to fire performance – Classes of fire-retardant treated wood products in interior and exterior end use applications. Ageing according to: En 927-6: Paints and varnishes – Coating materials and coating systems for exterior wood – Part 6: Expo-sure of wood coatings to artificial weathering using fluorescent UV lamps and water. Fire performance according to ISO 5660-1:2015: Reaction-to-fire-test – heat release, smoke production and mass loss rate – Part 1: Heat release rate (cone calorimeter method) and smoke production rate (dynamic measurement). Burnblock has successfully tested Western Red Cedar and Thermally Modified Pine based on the requirements for Durability of reaction to fire performance. Accordance to the fire behavior in the standard EN13501-1 total heat release “THR” the max. of THR is 7,5 (MJ). 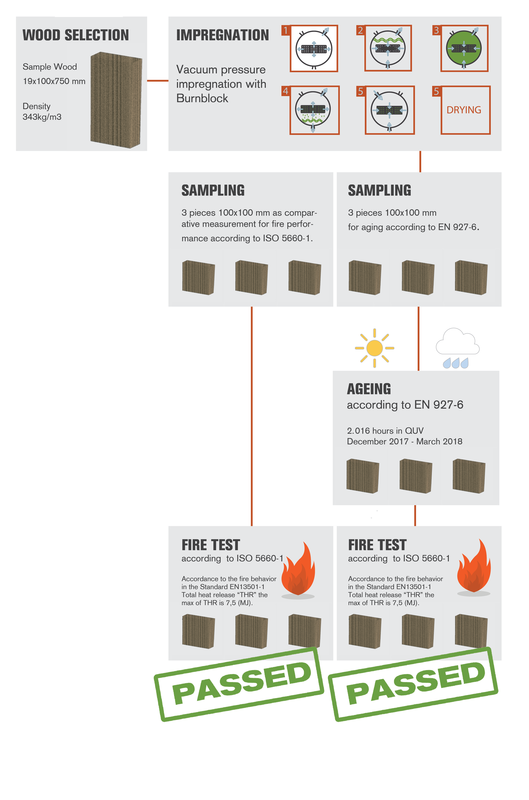 The graphic below shows the test process of durability of reaction to fire performance. The tables below give yearly averages for rainfall plus snowfall at major cities throughout Europe. Each place has a total for how many days of wet weather it usually gets a year and for the normal amount of precipitation.